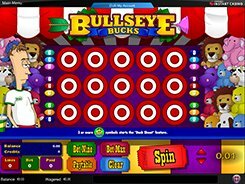 Bullseye Bucks has 3 rows and 5 columns of symbols that makes it look like a common five-reel slot. However, the game has a totally unconventional layout manifested in a few ways. First, before the Spin button is clicked, the game field is represented as a 5x3 grid of identical shooting targets. Second, the five columns do not spin as it is the case in other slot machines – instead, clicking the Spin button makes the targets turn over to the other side revealing different symbols that are themed around amusement parks. The slot has a wild symbol depicted by an ice cream cone, three bonus features and a 2500-coin jackpot. 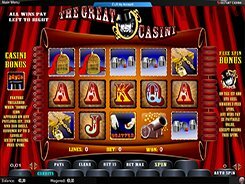 Considering that the slot has 9 paylines and a maximum bet of $225 per spin, the mentioned jackpot value is equivalent to $62,500 if betting max. A respective bonus feature – Pete’s Payday, Prize Pick or Duck Shoot – is activated when 3+ matching bonus symbols land on adjacent reels. During any of the three mini-games you may win up to 2700 coins! Thanks to a unique design, flexible wagering options and a lot of original features, Bullseye Bucks will appeal to many gamblers out there. PLAY FOR REAL MONEY!